VICTORVILLE, Calif. - A self-driving SUV called Boss made history by driving swiftly and safely while sharing the road with human drivers and other robots. The feat earned Carnegie Mellon University's Tartan Racing first place in the DARPA Urban Challenge. Officials of the Defense Advanced Research Projects Agency (DARPA) today declared Boss the winner of Saturday's event, which pitted 11 autonomous vehicles against each other on a course of suburban/urban roadways. The first-place prize includes a $2 million cash award. After reviewing judges' scorecards overnight, DARPA officials concluded that Boss, a robotized 2007 Chevy Tahoe, followed California driving laws as it navigated the course and that it operated in a safe and stable manner. Surprisingly, many of the robots made good decisions, said DARPA Director Tony Tether. That meant speed became the determining factor, Tether said, and Boss was the fastest of the competitors by a large margin. Boss averaged about 14 miles an hour over approximately 55 miles, finishing the course about 20 minutes ahead of the second-place finisher, Stanford. "Robots sometimes stun the world, inspire a lot of people and change the belief of what is possible," said William "Red" Whittaker, a Carnegie Mellon robotics professor and team leader of Tartan Racing. "We've seen that here and once the perception of what's possible changes it never goes back. This is a phenomenal thing for robotics." Showing the world that autonomous driving technologies are robust and will ultimately make driving safer and more enjoyable has been a major goal of the 45-member Tartan Racing team. "This is really a fantastic accomplishment," Tether said. "I watched these things driving and I forgot after awhile that there was nobody in there." Autonomous driving technology will save lives on the battlefield, he said, by removing soldiers from supply convoys and other vehicles in harm's way. DARPA had declared Boss the top-rated robot in the event based on its performance on a series of qualifying runs at the former George Air Force Base in the week prior to the final event. Boss was slated to start first on Saturday morning, but radio frequency interference caused in part by a Jumbotron television monitor next to the start chute jammed GPS signals to Boss. The TV monitor was subsequently shut down, the GPS signals returned and Boss was ready to go. The delay cost Boss the pole position it earned in qualifying runs and resulted in Boss being the 10th robot to start. But the robot performed impeccably despite occasionally being caught behind slower moving vehicles in the early going. With each of its three required missions, Boss steadily gained time on its rivals. Stanford's robot, which started second and about 20 minutes ahead of Boss, was the first to cross the finish line, but Boss beat Stanford's time by 20 minutes. "Everything that I saw Boss do looked great," said Chris Urmson, the team's director of technology. "It was smooth. It was fast. It interacted with other traffic well. It did what it was supposed to do." As the second-place finisher, Stanford received $1 million. Virginia Tech's Victor Tango team finished third and received $500,000. The robots entered by teams from the University of Pennsylvania, Cornell and MIT also finished the race, though Cornell and MIT both exceeded the six-hour time limit set by DARPA. Tartan Racing includes Carnegie Mellon faculty, staff and students from the School of Computer Science's Robotics Institute, as well as Carnegie Mellon's College of Engineering. It received major support from General Motors, Caterpillar and Continental AG. Strengthening the team were engineers from GM, Caterpillar, Continental and Intel who were embedded with the team in Pittsburgh. Boss was rigorously tested during its development, with two identical versions of the machine logging more than 2,000 autonomous miles, many on a brownfield site in Pittsburgh known as Robot City. One of the team's advantages was a software system it developed called TROCS, which produced graphic animations of Boss's sensor and data inputs during each run. Much as game-day video allows the Pittsburgh Steelers to review and analyze their play, TROCS enabled Tartan Racing to understand what Boss saw as it drove and how and why it responded to its environment. Troublesome behaviors could be quickly identified and fixed, while appropriate behaviors, which might occasionally look odd to an observer, were left untouched. Tartan Racing benefited from team members, including Whittaker and Urmson, with experience in two previous DARPA Grand Challenge robot races. It also built on the wealth of expertise of Carnegie Mellon's Robotics Institute, one of the largest robotic research and education organizations in the world. 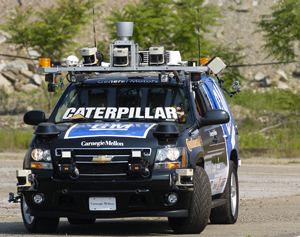 In addition to GM, Caterpillar and Continental AG, Tartan Racing's sponsors include Intel, Google, Applanix, TeleAtlas, NetApp, Vector CANTech, Ibeo, Mobileye, HP, CarSim, CleanPower Resources, M/A-Com and McCabe Software.